Air pollution in the Asia Pacific region is not only a major health risk, it also has damaging impacts on the environment and agricultural crop yields. A new report by the Climate and Clean Air Coalition (CCAC) and United Nations Environment Programme – titled Air Pollution in Asia and the Pacific: Science-based solutions – discusses how these impacts have significant economic consequences, affecting economic growth as well as welfare. The report notes that while existing laws and policies have made progress in reducing air pollution in the region, further action is needed to bring air quality to safe levels. This report presents the first-ever scientific assessment of air pollution across 23 countries in the region. Using world-leading scientific models, the report outlines 25 policy actions that could achieve safe air quality levels for 1 billion people by 2030 – with numerous benefits for public health, economic development and the climate. Strong coverage of this report, in global business press, including by the Financial Times, NY Times, Weather Channel and others, helps tell the larger story about the many hazards of polluted, toxic air and the seriousness of this issue in the Asia Pacific region. As the New York Times notes, India holds nine of the top 10 spots for the world’s most polluted cities according to some recent rankings. Shops in Delhi now sell “pollution guard” sunscreen and shampoo. This recent report also calls attention to the relevancy of the recent breakthroughs by a unique partnership between Dell and Chakr Innovation, an India based start-up founded by three young engineers who believed that our quality of life depended on the quality of air we breathe. The team developed a technology that captures the soot from diesel generators and turns it into a carbon black used to make ink. 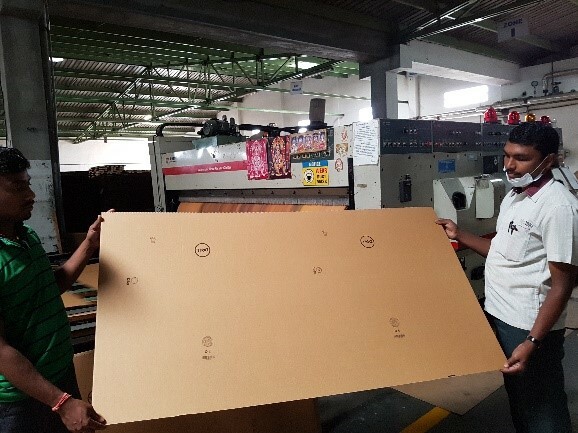 Dell now uses the ink on 1.5 million Dell boxes that ship out of India each year. Overall, Dell ships approximately 8.4 units per second. At that volume, it is imperative to design our packaging and shipping processes around efficiency and waste minimization. This invites the opportunity for innovation – highlighting the value of innovators like Chakr so we can help Dell and our customers reduce their waste through creative design, innovative material choices and better logistics. Explore more here on how Chakr’s process works. It’s these types of innovations that Dell loves to support and help scale. Dell is all about supporting companies offering solutions that can assist with different environmental and social issues that impact our society. If you have an innovative product that helps Dell meet its 2020 Legacy of Good goals, Dell invites you to share with @dell4good #legacyofgood or legacyofgood@dell.com.